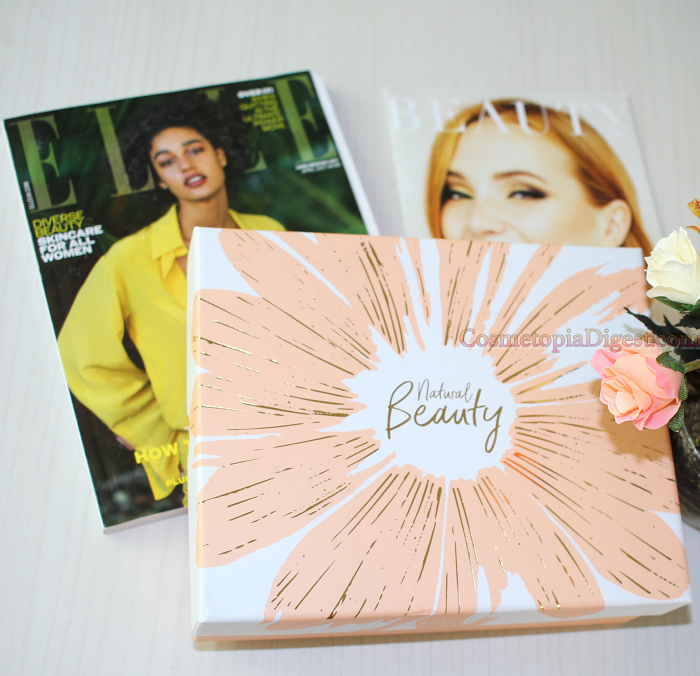 The April 2017 beauty box from LookFantastic is themed Natural Beauty - no, it does not mean natural products, but includes products which impart a natural, healthy look. I expected a light foundation in there and I was right. The external box is very Spring-themed. 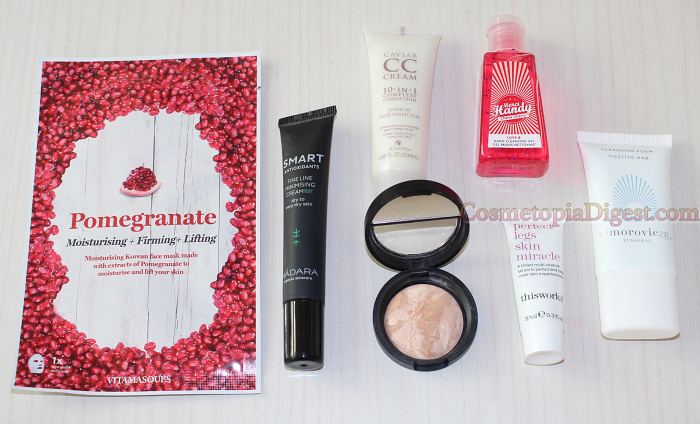 As usual, it comes with the Elle UK magazine, as well as the LF Beauty Box magazine. April being my birthday month, I hoped that this box would not contain fake tan or vitamin pills. Was I granted my wish? Find out below. 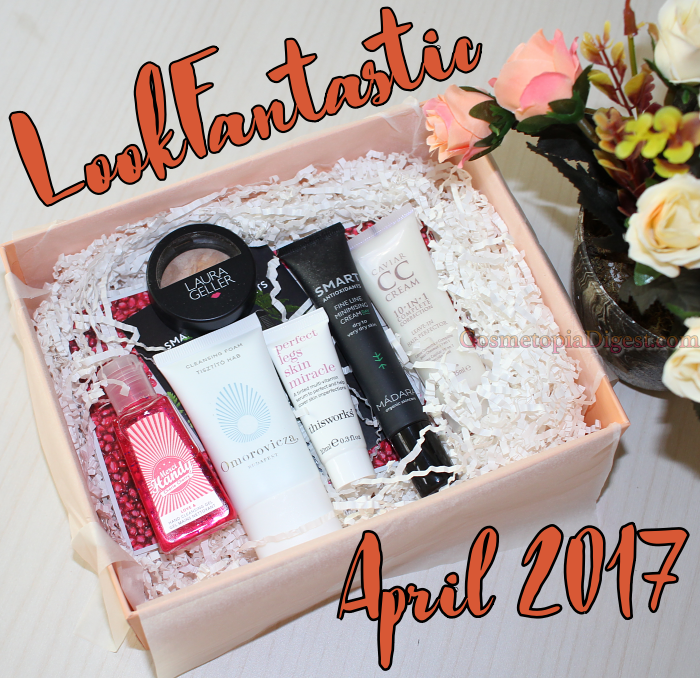 Scroll down for the unboxing and review of the LookFantastic Beauty Box for April 2017. It sounds like they've increased the total number of products this month - with no change in price. Nice! Gosh, any beauty box containing Omorovicza is a winner in my book. This super luxurious, high-end Hungarian brand contains thermal spa water from springs in Hungary, and this wonderful-smelling, sulphate-free cleanser is more creamy than foamy. I usually would hate receiving foundation in a beauty box. This one contains a bunch of tones that blend together nicely, and suits me well enough. Will be using it as a setting powder or for touch-ups. Prevention is better than cure, so I'm going to incorporate this as the eighth - or ninth - step in my nighttime skincare routine. A leg serum (yes, really) rich in Vitamin C. This is timely - I wanted something to remove the reptilian fish scales that always turn up after February. Sheet masks are a staple in my routine - I go through a handful of these each month, so it is always good to get more. This one promises to firm, lift, and moisturise. I'm not picky. As long as it has plenty of hydrating serum, I'll use it before a final moisturiser/facial oil. I have a bazillion samples of these. While it does not make my hair greasy, and actually calms it down, I'm too lazy to remember a leave-in cream on most days. It's usually wash, towel dry, spritz on some hairspray - if I can be arsed - detangle, run. A hand sanitiser that I can stick into my handbag. There were three versions of these in various boxes - I got cherry, which I love. This had actually come in the Selfridges Advent Calendar, which was sold out by the time I hit checkout, so I'm glad to get my hands on this. No vitamin supplements, and no fake tan - and there is Omorovicza, and Laura Geller makeup. I can use everything in this box. Last month, the showstopper was Oskia. This month, Omorovicza. I wonder what luxury brand LookFantastic will send out next? Alpha-H? Zelens? I cannot wait to find out. To subscribe to the LookFantastic Beauty Box, go here. It costs £15 a month - or as low as £13, depending on the duration of your subscription, and they do NOT take money in advance, but charge you each month when they ship. Neat.